In most areas of the UK we have been lucky enough to have our household rubbish collected on a weekly basis and, in some places, recycling boxes are supplied and collected either weekly or fortnightly (every two weeks). This is, however, all about to change. A lot of us are now being advised that our rubbish/trash/garbage (whatever you want to call it) will only be collected every two weeks, alternately with our recycled material. They say this is to encourage us all to recycle more as our landfill sites are nearly full but cynics feel that cutting costs could be a factor in this decision. Many people are very concerned at the effect these reduced collections will have on health and local environment and, it is with this in mind and the fact that I received some suggestions on how we can help reduce any adverse affects, that I have decided to add this page to the site. Avoid over filling bins and always try to keep the lid closed flat. Avoid leaving leftover food exposed to flies before putting it into the bin. Double wrap kitchen and animal waste in re-used carrier bags or newspaper. Remove as much air as possible before sealing the bag. Rinse all cans and bottles before placing in the bin ( or better still re-cycle them). Where possible keep your bin out of direct sunlight. Clean and disinfect your bin regularly with products like Zoflora Antibacterial Bin Freshening Gel. Clean up spillages around your bin straight away. 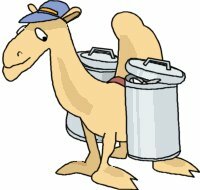 Remember to leave your bins in the correct position on the right day for collection. Sprinkling vinegar or bi-carbonate of soda (baking soda) into the bin will help reduce odour. After the bin has been emptied, place some clean newspaper in the bottom which will absorb any moisture from the rubbish. Put cat litter in the bottom of your bin to reduce the smell. N.B. - this only applies to general rubbish/trash not the recycling bin as the cat litter could contaminate the recycling process.